Does the vine and leaf petioles have solid stems? It looks kind of like a C. moschata type that I'm thinking of growing next spring called Naple's Long. There's one other similar variety with a different name in Italian. I,ll see if Ai can find it. I got a few bigger than this, but from what I've now read these things get giant. I always plant my winter squash around mid-July. Getting a late crop is the only way I have been able to grow most here with the hot climate. Butternuts always did well but I find I don't like them until a light frost hits them. I find I have to plant varieties like Hubbard in the shade of corn or tall tomatoes to even get fruits. 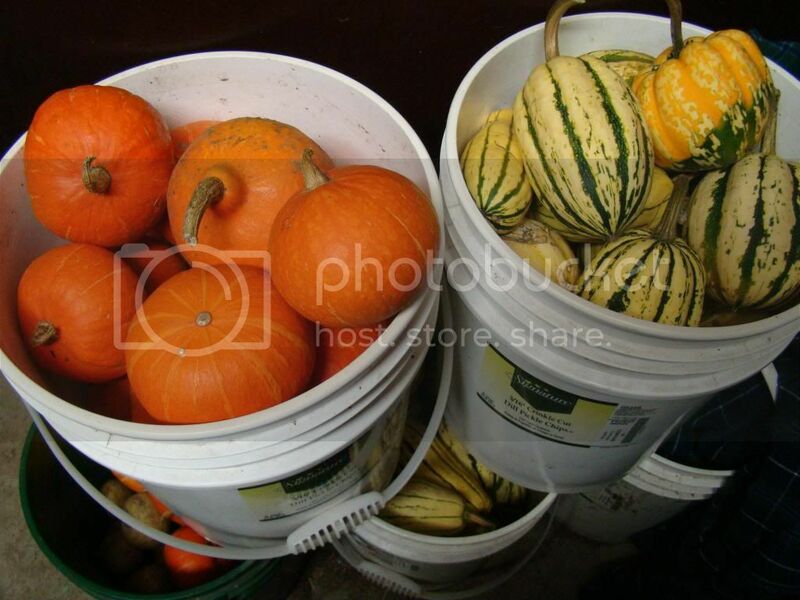 I can only use a small amount of winter squash since there is just two of us. I have also found that not many people want to buy a large squash. I have decided that next year I will only plant acorn, delicata and butternut. 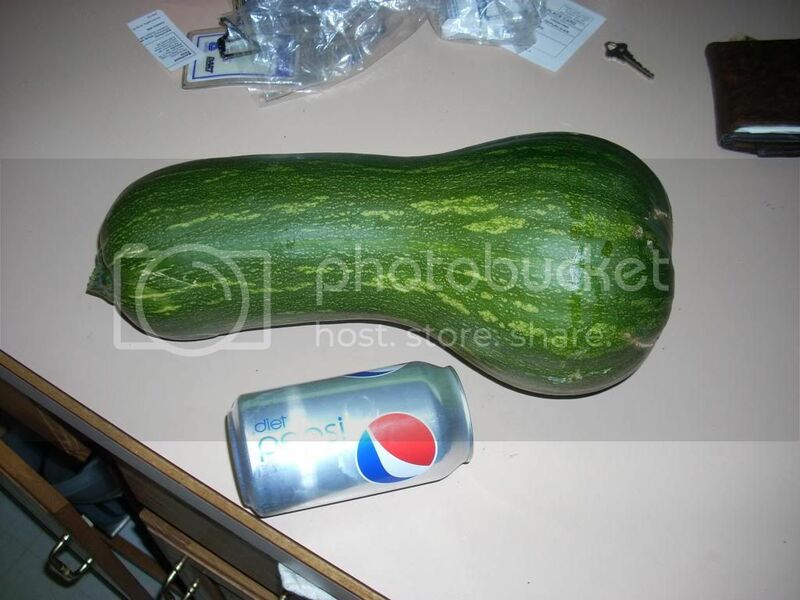 Now if you want to grow it for the thrill of getting a huge squash, go for it. I get 3 or 4 hubbards every fall, process them and freeze them. They are not as good as fresh, but close. For a little different color and taste you may want to add Red Kuri and Carnival. I personal like the small single or two servings size squash. I believe they have more flavor less watered down. Plus less waste but the compst pile never complains. gixxerific wrote: Plus less waste but the compost pile never complains. No waste. Ducks love cooked squash, seed cavity and skin. Either way Eric you are good to go. Eric, I am going to assume you grew those red ones? Did you have any other C. maximas growing on your plot? If not you could sell seed like crazy. If you had other maximas they would be crossed and the seed not worth much. I am first in line for some seed if you tell me they are not crossed. oooh, red kuri- I finally got to taste one- yuuummy, nice size for 2. Saved all the seeds, and bought some blue kuri. They are essentially hubbards right? How many fruit per vine, are they huge plants? jal_ut wrote: Eric, I am going to assume you grew those red ones? Did you have any other C. maximas growing on your plot? If not you could sell seed like crazy. If you had other maximas they would be crossed and the seed not worth much. Sorry James. They are most likely tainted. 2012 I grew Scarlet Kabocha "Sunshine", Hubbard "Red Kuri and Buttercup "Burgess strain" All three are C. maxima. Acorn "Jester" and Sweet Dumpling "Carnival" are both C. pepo and most likely have crossed. Tonio wrote: oooh, red kuri- I finally got to taste one- yuuummy, nice size for 2. Saved all the seeds, and bought some blue kuri. They are essentially hubbards right? How many fruit per vine, are they huge plants? Johnny's Selected seed has Red kuri at 2 to 3 fruit per plant. Even with my poorly prepped soil and growing among the corn, had 2 per plant.